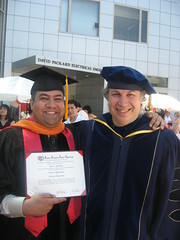 It is official, last Sunday (June 17th, 2007) was the graduation ceremony at Stanford, my PhD degree is now conferred and I received the diploma. When I came from Egypt to Stanford in Sept 1995, my goal was to get the PhD and return to my country to teach (I love teaching). That goal changed quickly though, as you can get spoiled very quickly in the Bay Area, it is truly a land of opportunity, cutting edge technology, natural beauty, and very hospitable for immigrants (folks here are from all corners of Earth). After joining Yahoo my career was flourishing, but I still had to get the PhD, it is like an Olympic medal, an achievement that I have to do for the sake of achieving it, more than anything else. To all those that helped me achieve this goal, my deepest thanks from the bottom of my heart. Powered by: WordPress • Шаблон: ADMIN-BG • 30 queries. 5.851 seconds.